A repository for maps and thoughts on the climate of various regions. What constitutes "nice" weather? That is a question that I have spent a lot of time thinking about over the years. Unfortunately there is no satisfactory answer. One person's nice day is reason enough for someone else to complain. We hear on the television newscast that the weather will be pleasant, or nice, or unsettled, or some other descriptive term that conforms to the expectation of what is most desirable. Without conducting a survey, I am left to arbitrarily decide what constitutes a pleasant day. Based on my own life experiences, I will subjectively say that 70°F is an ideal temperature for a plurality of individuals. I know, I know, there will be a lot of complaints about this. Earlier this year I wrote blog posts about Picture Perfect Weather Days and Dreary Weather. Please feel free to check out those posts for more thoughts on what constitute ideal, or crappy, weather. What if have a passport and decided to expand our travels to include Canada and Alaska (no passport required). The portion of the trip that begins in deep south Texas on January 1 all the way through the first part of June remains the same as before. Figure 1. 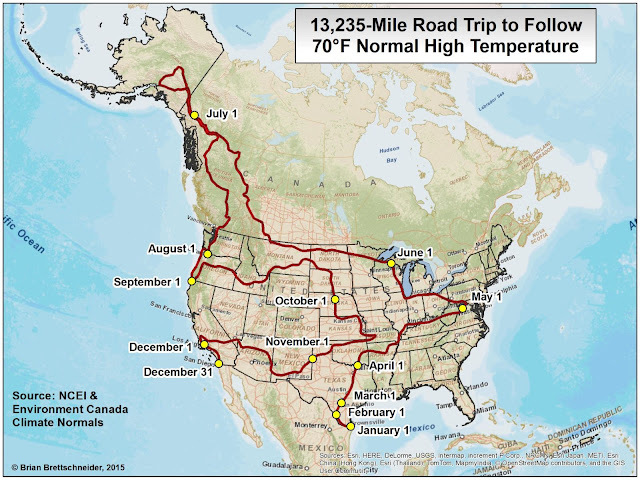 Proposed route across North America where the normal high temperature is always at, or very near 70°F. On January 1, the normal high temperature in deep south Texas is 70°F. This is a good place to start the trip. By February 1, our road trip has only progresses as far as Laredo, Texas. The next two months will be spent on Interstate 35. On March 1, the slow trek is only pulling up to the south part of San Antonio, Texas. Throughout the month of March, the higher sun angle warms things up and the trip has taken us to the Texas/Oklahoma border by April 1st. Now that April is upon us, we start heading east and northeast until we near the nation's Capitol by the end of the month. During May, we go through Pittsburgh and Chicago and end the month in extreme northern Wisconsin on June 1st. A tour of the northern states is in order to during June. In fact, we go more miles in June than any other month. Starting around the second week of June, our route makes a right turn on to the Alcan Highway. We travel through Calgary and go past Whitehorse on our way to and through Alaska's two largest cities. The month ends near Whitehorse (again) heading southeast. In July, we turn on Highway 37 and head south toward Bellingham, Washington, and finish the month in Portland, Oregon. The August portion of the trip is a scenic section along Highway 101 through Oregon. In September, we loop back onto Interstate 5 before turning due east in Eugene, Oregon. We continue through to the Snake River Plain in Idaho before turning south through South Dakota and into Nebraska. In October, the trip makes its way to near Kansas City, Kansas, Tulsa, Oklahoma, and ends at the Texas/New Mexico state line. The November portion of the trip follows Interstate 10 from Las Cruces, New Mexico, to Arizona, where it then heads north along Interstate 40, before departing for Las Vegas, Nevada, and ending near Los Angeles, California. December is another leisurely month that only takes us from Los Angeles to San Diego, California. This version of the route traveled through parts of 31 states and 3 Canadian provinces. All-in-all we put over 13,000 miles on our vehicle. Figure 2. 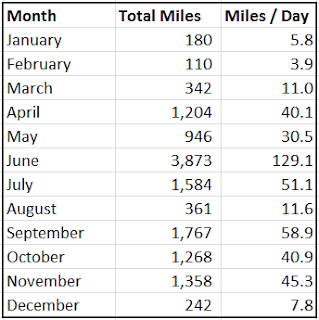 Total mileage and average miles per day for route shown in Figure 1. Near Glacier National Park, the route turns south along Highway 93 and passes Yellowstone National Park and Grand Teton National Park. The route then turns southeast and travels through central Wyoming before settling near Denver, Colorado. The next two months are spent leisurely traversing the Colorado high country ending up near Durango, Colorado. Once we make it to September, our trip takes us back through Yellowstone National Park and southern Montana, before turning south through South Dakota and into Nebraska. The period of October through the end of the year are then identical to the North America route shown in Figure 1. This version of the route traveled through parts of 30 states. All-in-all we put over 9,000 miles on our vehicle. Figure 3. 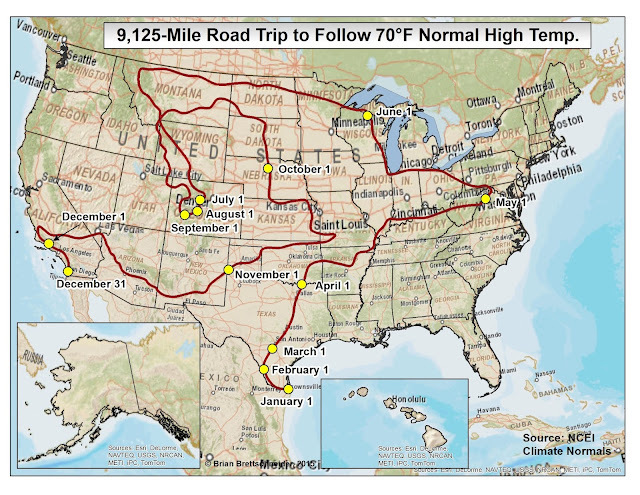 Proposed route across Contiguous U.S. where the normal high temperature is always at, or very near 70°F. If you are really interested in 70°F temperatures, here is a YouTube video that I put together showing the stations with a high temperature within 1°F of 70°F for every day of the year. Figure 4. YouTube video showing the progression of 70°F days throughout the year. Figure 5. 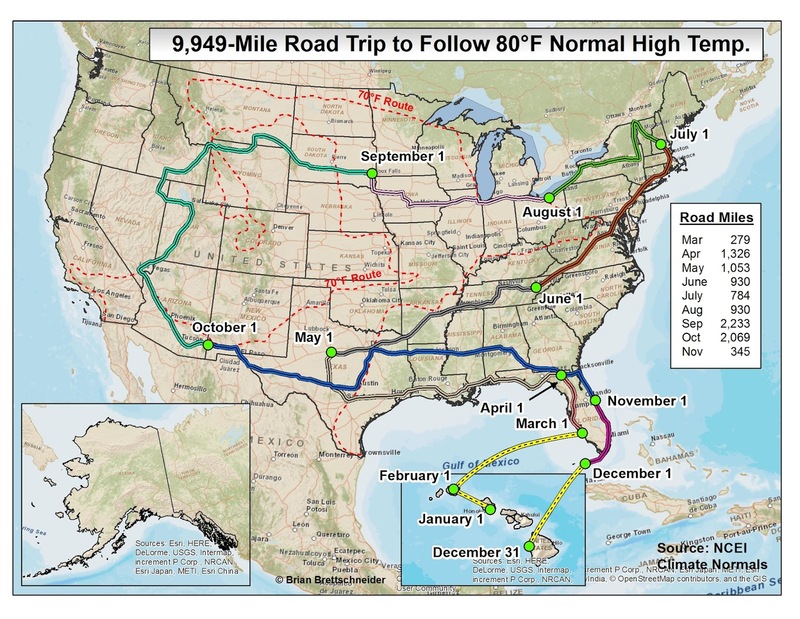 Proposed route across Contiguous U.S. where the normal high temperature is always at, or very near 80°F. Figure 6. YouTube video showing the progression of 80°F days throughout the year. How fast might you need to travel at any given point on your paths? It would appear that you could walk the distance in January or February but would need a car June. Or could you travel by bicycle? This is tongue in cheek article will appeal to oldsters in motor homes. You'll have to add a drop down list of attractions etc before you can compete with the AAA. Oh c'mon inland Texas over coastal Florida? No thanks, I think I can do better myself. Re: the segment along the Oregon coast: it's along U.S. 101, not "Highway 1." Ah, thank you. The text has been edited to reflect that change. I have a cheaper and easier way to always have great weather. I decided years ago that I would learn to love all weather. And now I bike to work in rain, sleet, and snow. I love it! Of course you left out my favorite area (the southeast) but what the heck, that leaves more room for me in my favorite camps. Fabulous article. Keep up the good work! I love the whole idea of this. As far as the naysayers, if you're so smartl make appropriate changes. Great concept. I want to try it!!! The November section of the 13k mile trip through Eastern and Northern Arizona could ruin one's 70-degree plans. US 191 (which helps you connect from I-10 in New Mexico to I-40 in Arizona) goes above 9,000 feet in elevation in Eastern Arizona -- and I-40 in Northern Arizona tops out above 7,200 feet. Each road often finds itself under a foot of snow or more before Thanksgiving. I love this article because it is so suggestive of a comfortable road trip. May I suggest making one between the 65 and 75 degrees parameters that covers similar territory - the 48 plus Alaska. Or even one with Hawaii thrown in. 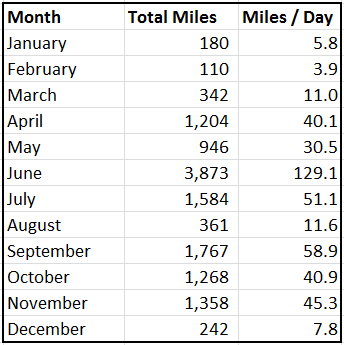 One issue with this as an actual trip is the huge variations between the months in miles covered. Perhaps the 65-75 parameters could help even that out a bit. I like the idea of staying perhaps in week each in 50 cities. Is it possible to make a map like that? Thank you for the comment. My experience is that once you start using a range of temperatures (e.g., 65 to 75), then the route planning becomes much more arbitrary and people say "why did you go there and not here?" Be that as it may, time permitting, I'll put something like that together. I would be interested in the lows for this trip. I'm afraid I would like about 75 degree days, sunny and lows in the low 50s to high 40s. No sleet, snow, ice or freezing rain. crazy huh? Brian, to your knowledge, has anyone actually attempted to follow your road trip map? I am seriously contemplating doing this but I want to edit the route to include more Canadian provinces. Can I contact you to discuss? Not as far as I know. There's a lot of chatter on some message boards but no one has contacted me yet. I'm planning to do this trip in just over 5 years when my youngest child is in college. I plan to start January 1 of 2022. I would like to get more information on the actual route. Can you please help? I'm so excited about this experience! Glad you like the map/post. To choose a route, I overlaid the 70°F days on to an Interstate Highway map. With few exceptions, the route follows those major roads. When it doesn't follow an Interstate, if follows a U.S. Highway. I did not save the exact route per se, but you should be able to figure out the series of roads to take. Thank you. I can't tell you how excited I am about doing this! Brian Brettschneider. Simple theme. Powered by Blogger.